This Miami home celebrates sunrises and sunsets, sea breezes and the colors of the tropics in a white box with contemporary vignettes in an unconventional backdrop for life that’s at once warm, bright and welcoming. sofi magazine’s spring edition captures glottman’s creation of a dream home in a seven-page spread. flowing fabrics, diffused light, color and interplay of textures set the stage for family life. the home has a touch of minimalism, a 60’s retro feel, street-wise culture, organic and plastic materiality, and some figurative manifestations. the results are unexpected: an unconventional backdrop for life that is warm and bright. 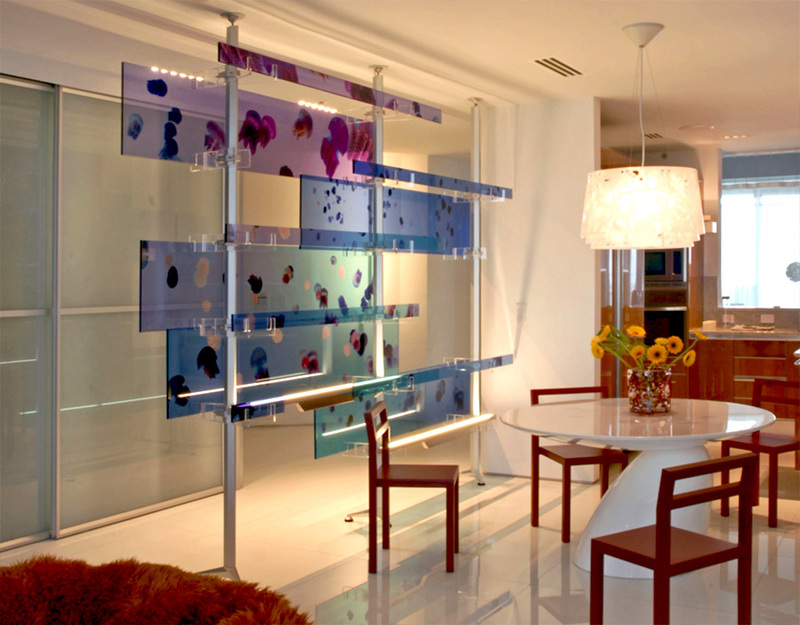 the project was produced with product and materials exclusively developed or imported by our studio. Contrast and interplay of soft lines and hard lines, graphic patterns and organic materials make up the children’s realm, with the informal dining area and kitchen beyond. 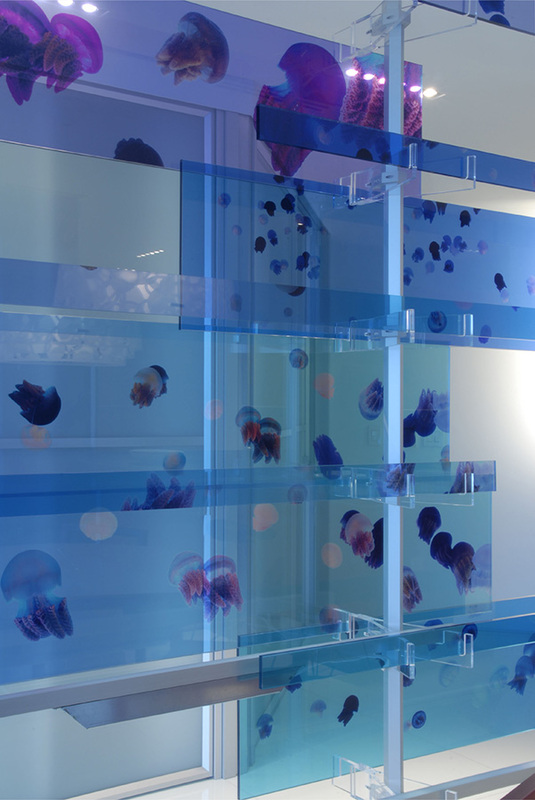 An installation made from photographic transparencies on acrylic separates the corridor. Navy blue wall containers, and 3 swiveling loungers made of fiberglass shells with neon orange leather are bathed in white light. They form part of the flexible seating arrangement of the living room. 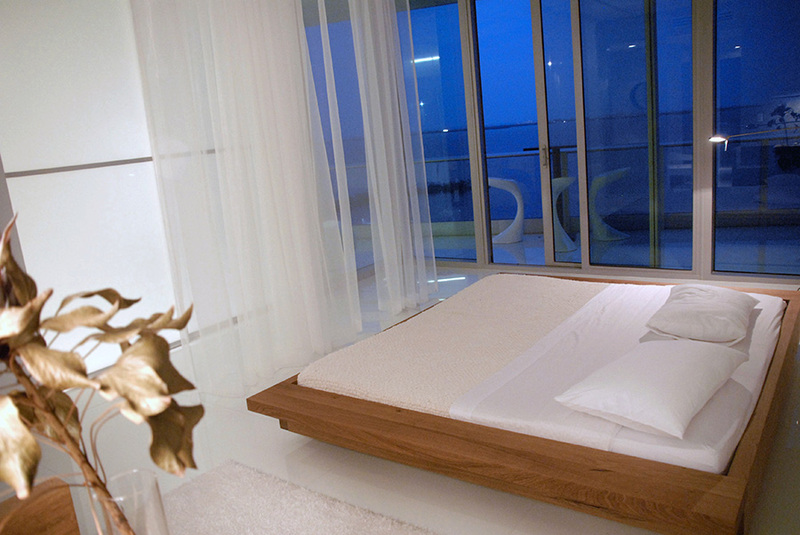 Flexibility is the main feature of the children’s bedroom. Sofas convert to twin beds, and a thick wool rug serves as neutral playground in-between. A desk is shared. Styrofoam shapes make for wall storage, and a confetti lamp celebrates youth. The living room sofa and dining room table at “mid-height” morph into a hybrid for dining in the living room and vice-versa. The beginning of a sheer flowing curtain is punctuated by a floating ball of light made with laser sintering technology. 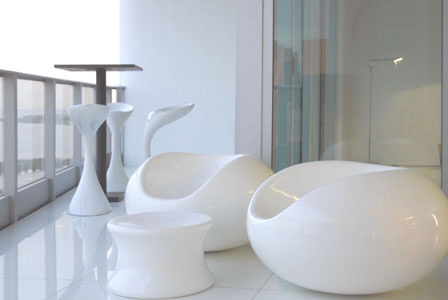 Classic fiberglass rockers from the sixties, a rubber bar height table, and three sculptural cantilevered stools offer maintenance free comfort for viewing the horizon to the east, and the harbor and marina below. Close-up detail of the sculptural paravan designed and produced by Oscar Glottman with images of jellyfish by Magnus Sigurdson celebrates the family’s second home by the sea. 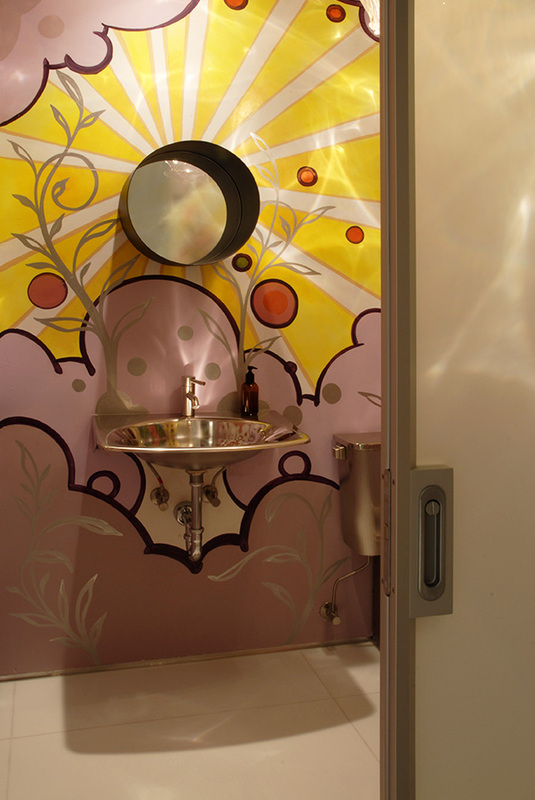 A folly is always possible in the powder room: street-wise graffiti by Francesco LoCastro with the children’s names is contrasted by stainless plumbing fixtures and a port-hole mirror. A clear resin globe above throws glittering stars of light at all the walls. Framing the elevator, a minimalist glow in fuchsia and white manifests the role of light as construction “material.” Translucent sliding panels welcome natural light and guests in to the home. Traditional swing doors in the master were eliminated and replaced with sliding panels and flowing sheer curtains; allowing for different levels of privacy at will. the airiness of the apartment.